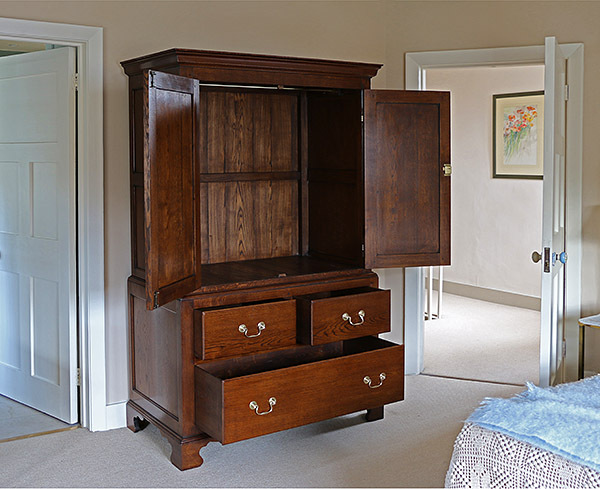 Our bespoke period style oak linen press, custom made to exactly suit our clients storage requirements. Specific dimensions were supplied to us, for the hanging space plus the maximum height of the hanging rail from the floor, so our client didn't struggle with reach. This dictated every other height measurement which, looking at the result here, worked perfectly. Photographed in the master bedroom of our clients Berkshire cottage.